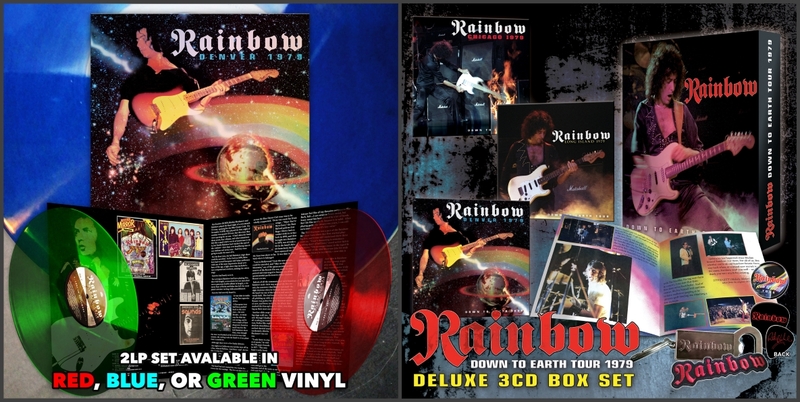 Ritchie Blackmore’s Rainbow Set To Release A Series Of Vintage Concert Recordings From 1979! Los Angeles, CA – In an era teaming with bands led by virtuoso guitarists and fronted by a singer with killer pipes, British rockers Rainbow stood head and shoulders above the crowd. Ritchie Blackmore’s hugely influential guitar playing mixed baroque bombast with blues rock brilliance, and laid the perfect sonic foundation for the versatile vocals of the late, great Ronnie James Dio. When Dio left the band in 1978, Blackmore along with drummer Cozy Powell recruited another vocal powerhouse, singer Graham Bonnet, and together with other new recruits including Deep Purple bassist Roger Glover and Coliseum II keyboardist Don Airey, recorded what would be one of Rainbow’s greatest achievements, their breakthrough album Down To Earth. Not only did that masterpiece spawn the band’s first charting single “All Night Long,” it also contained the all-time classic, rock radio staple “Since You Been Gone.” The subsequent Down To Earth Tour became the stuff of legend with a groundbreaking light show and a set list packed to the gills with fan favorites like “Man On A Silver Mountain” and “Long Live Rock And Roll” but still plenty of room for Blackmore’s own six-string pyrotechnics. Now these incredible performances are being released for the first time with the pomp and pageantry worthy of these historic recordings, courtesy of L.A.-based Purple Pyramid Records. Available now is Denver 1979, an extraordinary concert album pressed on vinyl in 3 different colors – red, green, or blue – and packaged in an eye-catching holographic foil gatefold jacket. And coming August 21 is a super deluxe 3CD box set featuring full-length concert recordings from Denver, Long Island, and Chicago each packaged in its own individual sleeve next to a whole boatload of classic rock goodies including a 1” color button, embroidered fabric patch, a Ritchie Blackmore signature guitar pick, and a combo bottle opener/keychain – all beautifully contained in a gorgeous red-velvet lined box. For fans of this extraordinary band, there can be no bigger pot of gold!